If you have 25 fans or more, you can grab a nice, clean vanity URL for your Facebook page. This makes linking to you and remembering your URL easier, as well as optimizes it for the search engines. 1) Visit facebook.com/username to walk through the wizard to choose the username for your vanity URL. 2) Choose a username for your personal profile. Before choosing a username for any of your business pages, you must choose a username for your personal profile. If you don't have a personal profile yet, you'll need to create one. 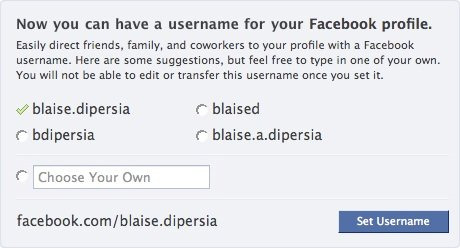 Facebook will give you a few suggested options based on your name. Select one of the suggested options or write out your own. Check the availability and confirm your choice. 3) Choose a username for your business page. It's best to simply choose your business name. You are commiting to this username forever, so you want to make sure it will stick with you as your business grows and changes. If you have multiple pages, you can choose a username for each. Usernames can only include alphanumeric characters (A-Z, 0-9) or a period (.). You can only have one username per page. Your page must have at least 25 fans to establish a vanity URL. This is to prevent name squatting. Usernames are not transferrable or editable. Some generic words (such as "flowers" or "pizza") are not available. If your trademarked name has already been taken, you can notify Facebook of this intellectual property infringement. For more FAQ, check out the Facebook Help Center.